BlackBerry isn't putting the cue in the rack just yet, today unveiling a brand new smartphone and the successor to the original BlackBerry Z10. Known imaginatively as the BlackBerry Z30, the new flagship handset packs the latest version of the BlackBerry OS, 10.2, into a body that, like its predecessor, lacks a physical keyboard. Keeping in line with the display size trend of late, the BlackBerry Z30 packs a 5-inch Super AMOLED screen with a resolution of 1280 x 720, which comes in with a density of 295 PPI. The SoC powering the phone has also been upgraded: the Z30 includes a Qualcomm Snapdragon S4 Pro SoC, and although the exact model wasn't specified, the chip will come with a 1.7 GHz dual-core CPU and Adreno 320 GPU on-board. The Z30's camera setup appears identical to the Z10, with the device packing an 8-megapixel rear camera with f/2.2 lens and a 2-megapixel front-facing camera. Other specs include 2 GB of RAM, 16 GB of internal storage, a large 2,880 mAh non-removable battery, 4G LTE connectivity, Bluetooth 4.0, NFC and dual-band Wi-Fi 802.11a/b/g/n. 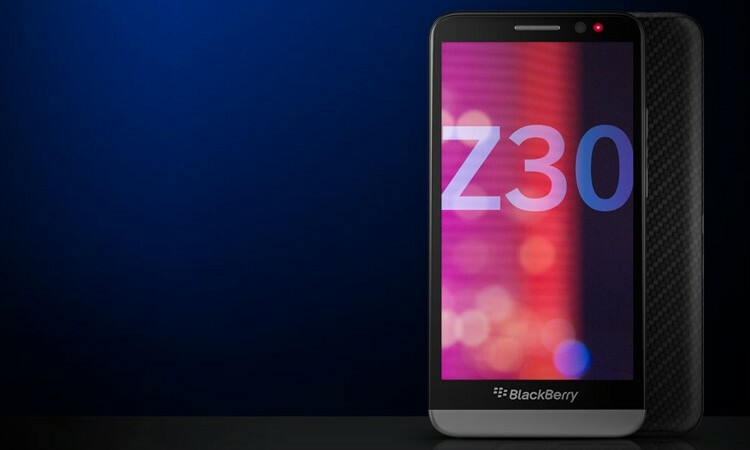 BlackBerry hasn't specified how much the Z30 will cost, but it's slated for release next week in the United Kingdom and Middle East, with a United States launch occurring before the holiday season. Although the handset comes with an improved set of specifications and a range of new features thanks to BB OS 10.2, it remains to be seen if the device can lift BlackBerry's slipping market share.